Galleri Heike Arndt DK Berlin presents the exhibition “Roleplay” with artists Ina Sangenstedt (DE)sculptures,and Ole Tersløse(DK) digital images. Exhibition opening in Berlin, April 1 , 2015 at 7pm. 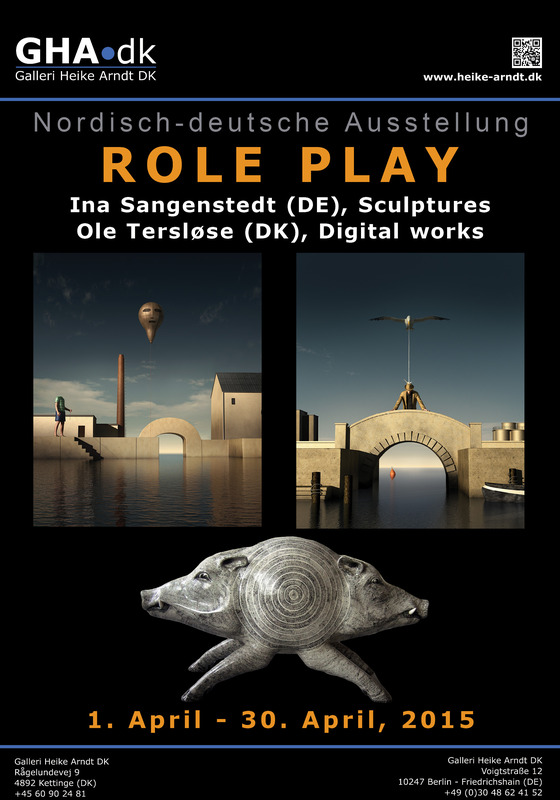 In ‘Role Play’ Sangenstedt and Tersløse explore and push the boundaries of identity and reality in compelling digital works and sculptures. Together they create a space influenced by surrealistic symbolic language and imagination, where our common perceptions are undermined and new ones are created. In the intriguing digital world of Tersløse, familiar subjects such as landscape and portraits, as found in traditional oil paintings, are transferred into strange, unknown places. The children forced to fit into small vases confront the limits and regulations of their, and our, behavior to fit in – all of us playing different roles every day. The same sentiment is reflected in the half-woman half-predator sculptures by Sangenstedt, urging us to question the conventions, the roles we are given in culture or society. Sangestedt’s animal sculptures offer an opportunity to contemplate animals both as sacred relics, as playful pets and even targets. In her work she explores the interchange between animals and us, and the influence we have on one another. She finds inspiration in the roles we give our faithful companions and ourselves. ‘Role Play’ balances both the contemporary and the timeless, presented in a poetic manner with a touch of irony and playful wittiness. Experience a silver frog with a human tooth and the unreal happenings at the harbor in the afternoon. What is real and what is illusion? Welcome to enjoy ROLE PLAY! In her sculptures, Berlin based artist Ina Sangenstedt explores the relation between animals and humans. Sangenstedt’s works evoke questions on accepted civilized behavior versus animal instinct. Whether your passion is collecting porcelain cat sculptures or playing with your dog, the exhibition brings new light on the relationships and historical interdependence between animals and man. Ole Tersløse is a terrific digital artist. Although at first glance his works may appear like photographs, Tersløse never uses photography as a base for his imagery; instead he creates every image from scratch. His powerful works investigate representations of (seemingly) realistic situations. By examining the ambiguity of the situations presented, the spectator is invited to explore and dwell in a parallel universe and hopefully get lost somewhere in between space, dream and reality.